Every expert, pastor, rabbi, therapist, or this big mouthed blogger will tell you that date nights are essential to long and happy marriage. Brett and I committed to having a weekly date night when our twins were born almost 4 years ago. A family of 5 living on one income CANNOT afford to go out on a date every week. It's just not going to happen! The cost of the babysitter alone puts it out of the budget for us. 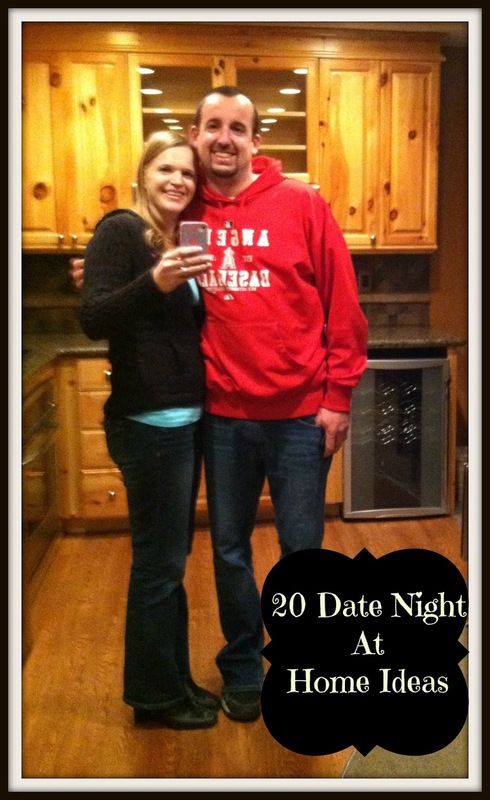 To get around this, we decided to create date night at home! Every Friday night, Brett and I make the kids dinner and then put them to bed a little early. Once they're in bed, our date night begins. We always eat together and then we have something else planned. Some nights I cook but most nights we get take out. It really doesn't matter what you do, just spend some time together. We've been on a big Shark Tank kick lately and dinner and a movie is done around here at least once a month. We are so busy with three young children and we know from our friends who have older children that it is very easy to get swept into the vortex that is having children. We use date nights to stay connected and recharge from the week. 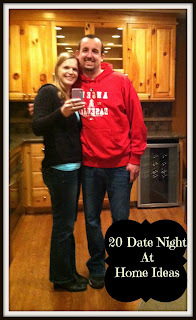 Here are some of the date nights that we have successfully done at home. 1. Dinner and a Movie - Easy and classic, you can't lose with this date plan. 2. Game Night - Grab a board game and have fun! 3. Massage Night - Eat a light dinner, we always go with sushi? 4. Wine and Cheese Tasting - I love these dates; we usually spend the whole night talking. 5. Beer Tasting - Grab a single bottle of various different beers that you've never tried before. 6. Watch Your Wedding Video - This one is usually done around our anniversary. 7. Bubble Bath - I think this one is pretty self explanatory. 8. Theme Night - Pick a theme and go with it! We've did a Mexican Theme Night and made shrimp verde enchiladas, margaritas, and played Mexican Train. 9. Picnic - No need to head outside, you can put down a blanket in your living room. 10. Copycat Night - There are certain dishes from restaurants that we LOVE! Find a copycat recipe and make it together. To be honest, in my house Brett just makes the salad and pours the wine. We did this last Friday and it was a huge hit! We talked at the table for a long time, just like at a restaurant! 11. Twenty Questions - It's not quite what you're thinking, we make a list of questions to ask like what is the first thing you'd buy if you won a million dollars? Silly things like that. 12. Would you Rather? - This is a board game, but we usually make up our own questions since its more fun! 13. Night Swim - While we no longer have a pool, we used to have a little 12' round 3' deep pool that I miss. There is something so relaxing about swimming without kids around. 14. Shark Tank Bets - We fell in love with Shark Tank this spring, I know we're a little late to the party. But we made it! We watch and bet on if they'll get a deal and who we think will offer one. Mark is the easiest one to read BTW. 15. Flashback Night - Remember those shows you loved as a kid? They are hilarious to watch now as an adult. DVR or rent a show that you both loved and watch it. And be prepared to be ashamed by what you used to love. 16. S'mores - Even if you don't have a fireplace like I do now (woohoo) you can make them stove top. Go beyond the basics and make them your own. I love making s'mores with 2 graham crackers, a brownie cookie, and marshmallow. They are wonderful!! 17. Dirty Game Night - You can buy X rated board games or make your own. I made Monopoly into a game that makes Brett grin whenever he sees the game. Just make sure you return it to its original form before the kids play with it. 18. Take a walk - How far you go will depend on the age of your children. We live in a cul-de-sac so we can make a little loop and the baby monitor still works. 19. Table Games - Do you have a pool table or ping pong table that you never use? Play a game and make a wink wink friendly bet. I'm pretty sure this is the only time our pool table gets used outside of parties. 20. Nothing! - I know this isn't technically an idea, but sometimes doing nothing together is just as wonderful as doing something! There have been many nights when we have something planned but ended up sitting on the couch talking all night. It's a great way to catch up with each other and connect. I hope this list inspires you to start a date night in your house. As you can see, it doesn't have to be anything magical or over the top, you just need to spend some time together. 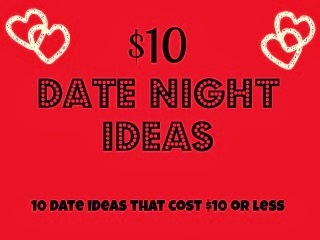 If you're looking for some cheap date night out ideas, head over to my $10 date night post. Do you have a steady date night? Great ideas. My husband and I generally watch movies or tv shows together. I love this list! After 2 kids I feel like our marriage is kind of dull and monotonous, too busy with kids. We need some spark.. I'm going to spend some quality date night every night. These list are very helpful. Great ideas...and...is that wine fridge built in to your kitchen? Will be trying some of these with the Mr until we can get out of the hosue. Thanks for sharing! I love these! We have a lot of "at home dates" but we could use some original ideas! I hope they help! It's so easy getting stuck in the dinner and a movie date rut. Cute ideas and good for Valentine's Day! Shark Tank bets - I like that! My boyfriend and I love watching that show together. Good ideas! I love these ideas! We've been trying to do a date night at least once a month; the last one was theme night and the subject was Italian/Italy complete with Italian dinner music. I love the wine and cheese tasting idea! The wine and cheese nights are some of my favorite dates. I'm a sucker for good cheese. These all sound like so much fun! Thanks for the ideas. Great ideas - at home dates are a weekly affair for us too, and we can always use good suggestions.